Photographers are listed alphabetically by surname on the following pages. Subjects, styles, advertising, other relevant information: Wailes was a life-long enthusiast for windmills and watermills, starting the interest as an engineering apprentice in Lincolnshire in 1923. In 1954 he published “The English Windmill”. His photographs of interiors and exteriors of mills in Cambridgeshire can be found in the Cambridgeshire Collection – forming part of the Cambridge Antiquarian Society’s survey of mills. Subjects, styles, advertising, other relevant information: The Cabinet photograph below, from the author's collection, is on a dark green mount with silver lettering on the face "Day and Electric Light Studios, H Wallis, 47 Burleigh Street, Cambridge" The reverse is blank - hand-written thereon "George and Birdie, March or May" but sadly no year, c.1910. The 1911 census shows Harry living at his in-laws at 78 King Street Cambridge with his wife Annie E. b:1879 Cambridge and son Thomas Rowland Wallis b:1894 Plaistow. Harry was described as an "artist and photographer" and his son as an "assistant photographer"
Subjects, styles, advertising, other relevant information: Daniel was listed as a photographic artist in the 1861 census. He was living at Balsham with his father; George Ward, farmer of 8 acres, b: 1811 Bartlow and mother Susanna b:1819 Quy Cambridgeshire, together with a younger brother and two younger sisters. By 1871 Daniel had married and was living at Balsham in a caravan with his wife Eliza - his occupation was a hawker. By 1881 Daniel had become a widower and was a general dealer, still living in a caravan at Balsham. References: "Newmarket, Home of Horse Racing A Pictorial Study", John Slater and Peter Osborn, 1968, Landmark Press, Lavenham, Suffolk. Subjects, styles, advertising, other relevant information: John Henry Watkins was the son of Charles W Watkins b: Brecon Breconshire 1848, a bank manager with the National Provincial Bank in Newport, Shropshire. In 1892 his father had died and in 1901 John was living with his widowed mother, Edith Mary Watkins at Church Aston, Shropshire, and had followed in his father's footsteps by becoming a bank clerk. By 1911 they had moved to 13 Clarkson Avenue, Wisbech and John was still a bank clerk. We know of his interest in photography however because in 1911 he exhibited one of his prints (a bromide print entitled "A Norman Courtyard") at the Royal Photographic Society's Annual Exhibition. His address was shown as the National Provincial Bank Wisbech. John married Barbara Gillett Pearson in 1917. References: Catalogue Royal Photographic Society's Annual Exhibition 1911. Subjects, styles, advertising, other relevant information: In the 1881 Census Joseph is listed as a dyer and photographer, an unusual combination of occupations. He was living at Horseway Chatteris with his wife Emma, b: 1837 Shoreditch, Middlesex, his three sons and 4 daughters. These were: Andrew Vawser Watts b: 1864 Todmorden, Yorks, Emily Augusta Watts b: 1865 March Cambs, George Albert b: 1869 March Cambs, Rosa Hannah b:1872 Chatteris, Amie Maria Watts b:1874 Chatteris, Arthur Ernest Watts B:1876 Chatteris and Amy Beatrice b:1877 Chatteris. Ten years earlier in 1871 Joseph was a sluice keeper living at the Sluice, Chatteris. By 1891 Joseph was no longer a photographer - he had moved to Salters Lode, Denver, Norfolk where he was a collector of tolls. In 1901 he was at the same location and his occupation was sluice keeper and collector of tolls. In 1911 Joseph was still a sluice keeper at Salters Lode. References: England Census 1871, 1881,c 1891, 1901, 1911. Subjects, styles, advertising, other relevant information: The 1939 Register lists Cecil at the above address and his occupation was shown as "motor mechanic and Photographer". He was married and living with his wife Kathleen V Webb b:1908 and daughter Christine b:1937. Cecil may well have been an employee or manager at Stearn and Sons 72 Bridge Street Cambridge. When Edith Florence Mary Benson, Nee Stearn died in 1950, Cecil John Benson was granted probate for her estate. Subjects, styles, advertising, other relevant information: FS Webb exhibited the photograph below at the St Neots and District Camera Club Annual Exhibition in May 1933. 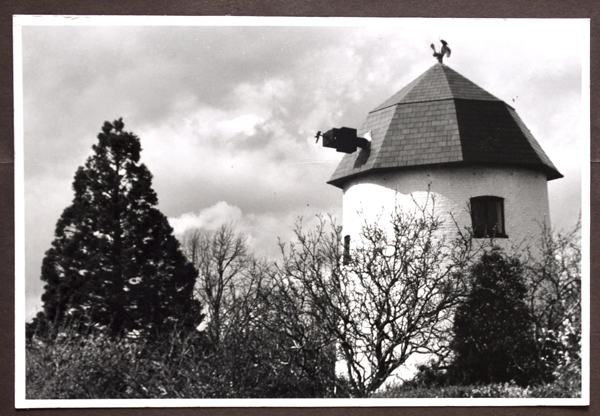 The photograph (11.5 x 8in) is entitled Eaton Ford Old Windmill now a residential home. The reverse has the photographer's details in manuscript, in a mini lable and has a St Neots and District Camera Club exhibition label. (This raises the point that occasionally former photo club presentation mounted prints can be found - and does each merit an entry here, or should they be separately recorded with other information on local camera clubs). Address: Bainton in 1904, Barnack, near Peterborough 1905. Working Dates: c. 1904 - 1925 ? 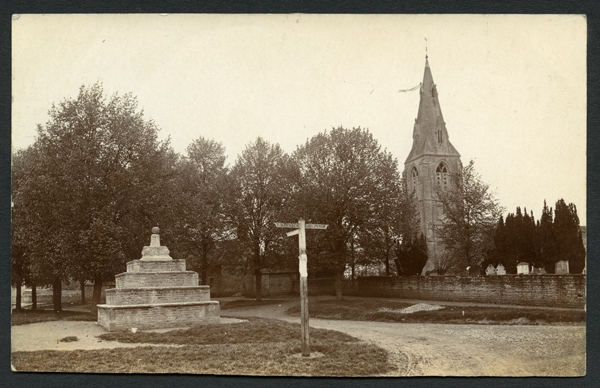 Subjects, styles, advertising, other relevant information: See below for a postcard of Bainton, near Peterborough (author's collection) on the reverse of which is printed "A Webster photo Barnack copyright". 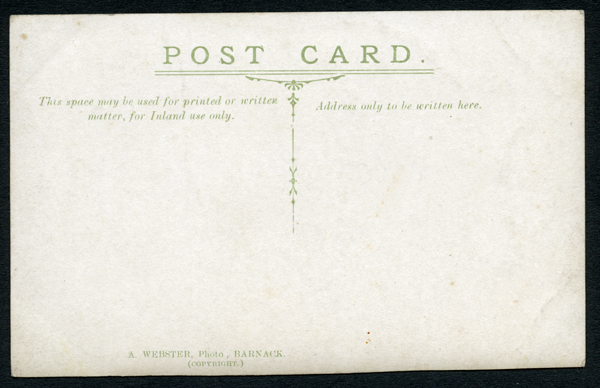 Also noted for sale on Ebay was a postcard of Maxey Church - in red ink on the face of the card the publisher was shown as "The AW Series", which could have been by Webster. 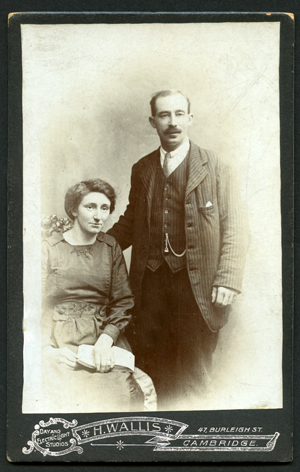 This appears to be Alfred Webster, b:1883 Barnack who was a "cycle agent" living in Barnack in 1911 with his wife Lily b:1884 Winwick Northants and son Leslie b:1904 Barnack. References: No trace found in local directories. A number of Alfred's photographs were lodged at Stationers Hall and have found their way into the National Archives at Kew. For example: TNA COPY 1/469/146 Photograph view of 'The Haycock', a street in Wansford. Copyright owner of work: Alfred Webster, Bainton, Stamford. Copyright author of work: Alfred Webster, Bainton, Stamford. Form completed: 15 January 1904, and TNA COPY 1/469/147 another Wansford view of the Church and Bridge Copyright owner of work: Alfred Webster, Bainton, Stamford. Copyright author of work: Alfred Webster, Bainton, Stamford. Form completed: 15 January 1904. COPY 1/481/314 is a 'Photograph of Uffington House fire taken at 11 o'clock at night, December 19th 1904'. Copyright author of work: Alfred Webster, Barnack, Stamford. Form completed: 6 January 1905. Also COPY 1/490/46 'Photograph of Deeping St James showing locks'. Copyright owner of work: Alfred Webster, Barnack, Stamford. Form completed: 4 October 1905. Peterborough Advertiser 22 July 1911 p2 has an article on a haunted rectory at Barnack, with "photos by Webster, Barnack specially taken for this article". Subjects, styles, advertising, other relevant information: Spaldings Directory of Cambridge lists beside her name “Private Appointments” The Wehrle family at 29 Sidney Street Cambridge in the 1911 census comprised Alfred Wehrle b:1855 Bishops Stortford, watch and clockmaker, jeweler, dealer, his wife Rosa b:1865 Baden, Germany, son Alfred A b:1891 Cambridge, an assistant in the business and daughter Lucia b:1898 Cambridge, so presumably Miss Wehrle in 1920-5 would have been Lucia Wehrle. The Cambridge Independent Press of 27/6/1913 noted the appointment of the Committee of the Cambridge Photographic Club for the year ahead were Messrs Coulson, Johnson, Ogle, Porcher, Tams, Scott, Wehrle and Winship. However, the Wehrle in question may have been A.A.Wehrle, Lucia's brother, who was reported to be a prize winner in one of the Club's competitions (CIP 14/11/1913). AA Wehrle was killed in 1918, a Sergeant in the Artists Rifles. Subjects, styles, advertising, other relevant information: A Cambridge commercial photographer undertaking work with Colleges within the University. He appears to have come to Cambridge from London. It is not known whether he was initially employed by another Cambridge photographer, but by 1939 at the latest his name appears on his work. The Cambridge Independent Press caries his photo of the Ickleton Football team on 14 April 1939 p15. A group photograph of third year undergraduates at Newnham College Cambridge dated 1946 was offered for sale on Ebay in January 2019. The photo is c. 6.5" x 11" and the mount is overall c.10" x 13" The mount had "Newnham College 3rd Year Students" in calligraphic writing across the top. Also on the mount, beneath the image, were the photographer's details "E.C.Weller, Cambridge". No trace has been found to date of Edwardlisted as a photographer in local trade directories. According to the 1939 Register Edward Clement Weller was a commercial photographer who lived at 44 Marshall Road, Cambridge with his wife, Gertrude Elizabeth Weller Nee Holmes, b.1906 and their daughter Anne R Weller b. 1937 Cambridge. Edward and Gertrude were previously living at 37 Miranda Road, Holloway, London in 1934. According to the local Electoral Register Edward and Gertrude were at 44 Marshall Coad Cambridge in 1945. By 1973 at the latest Edward was living at 26 Riverside Cambridge and when he died on 22 July 1988 he was still at this address.